Ninth Update – Before and after | Software Inc. 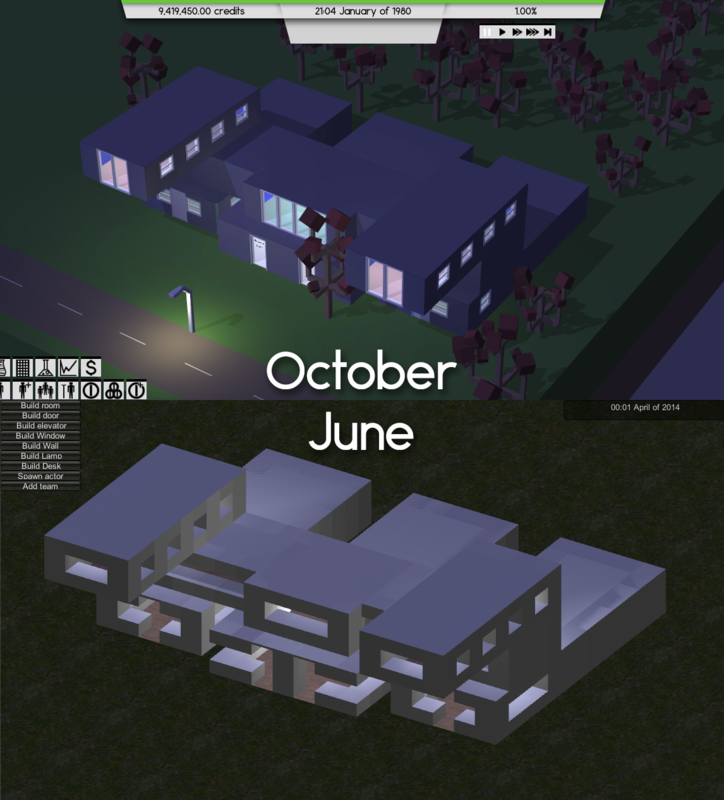 I wanted to do a comparison of my game from when I started developing Software Inc., around the 4th of June, and now, in October. Sadly, I’ve only begun using source control recently, so I couldn’t go back to an old version, I had to manually replicate old screenshots. This is the second ever screenshot I took of the game. I started off just making the building mechanics. In the beginning each unit of wall was completely square, took up an entire cell in the grid and worked like in Prison Architect. Now, walls are thin and sit at the edges of the grid, like in the Sims. You get much more space out of a room, since you can build stuff where the walls used to be. It is really obvious in this picture from June that walls are placed in the center of the grid rather than at the edges. All the programmer art has been replaced and the style has gone from an ugly stab at realism to smooth minimalism. I went for minimalism since I wanted the game to have depth in its simulation of the market. 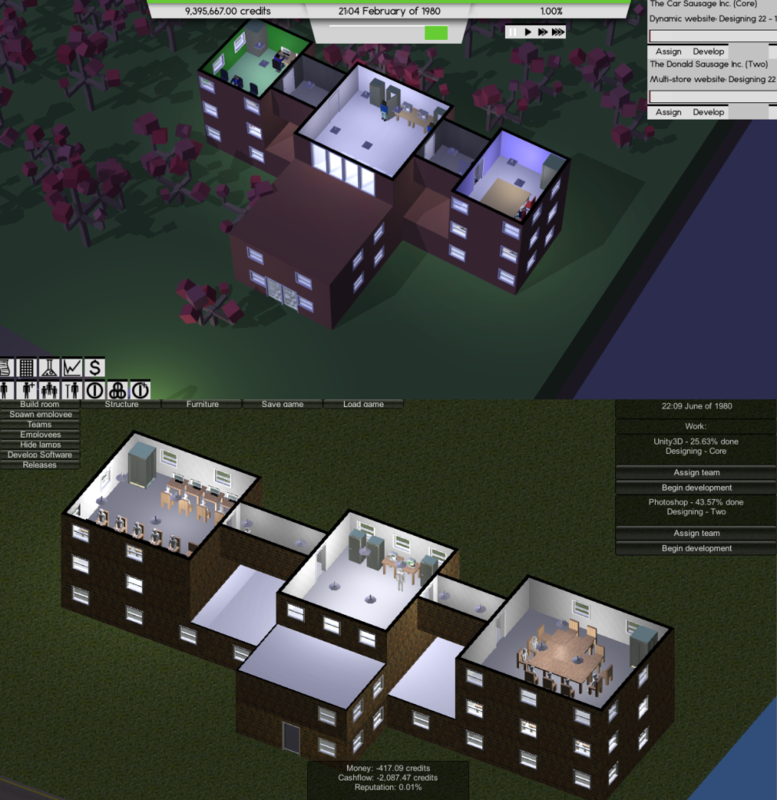 Having loads of detailed textures and bump maps would only clutter the screen, which is already full of windows, information and buildings spanning multiple floors. With the minimalist style, I believe its easier to get an overview of the offices. Another reason was that I am not a professional 3D-modeler, making everything flat shaded and simple made it easier on myself. It is not visible in this picture, but the “255.0 credits was paid for rent”, etc. messages that take up a lot of space in the bottom of the June picture has been replaced with a Dungeon Keeper style message system. I’m really tempted to add a *clink* sound when new messages arrive. The last try at replicating an old screenshot didn’t go as well, the measurements are really off, but it gets the point across, I think. You can see work items in the top right corner, these describe things that are being worked on in your company. 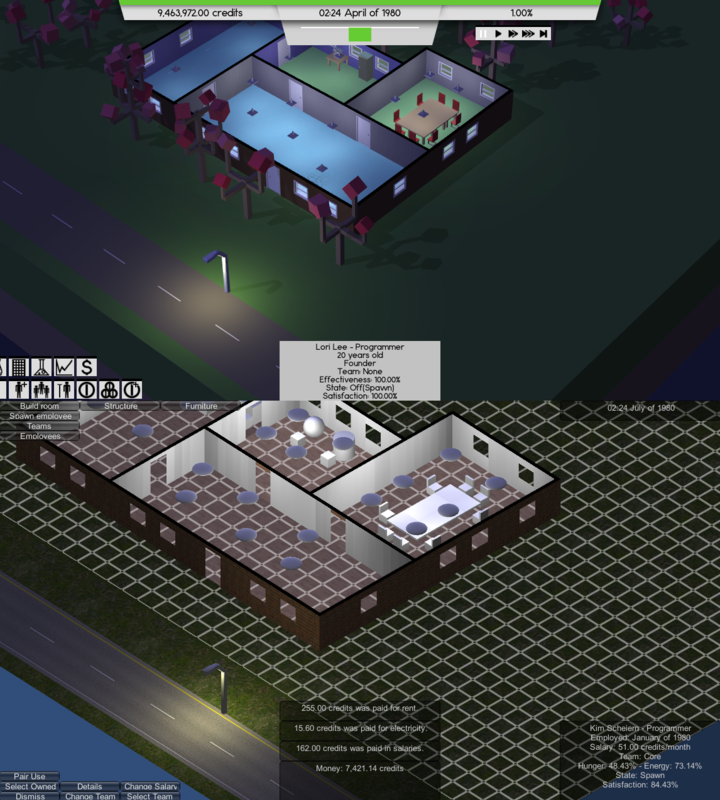 I’ve given them a bit of an overhaul from their clunky Unity look, they can now be collapsed and pinned to rooms. On a final note, I’ve almost finished founding my company, Coredumping, and I will be releasing a web demo of Software Inc. at the end of this month. This blog is currently not being updated.